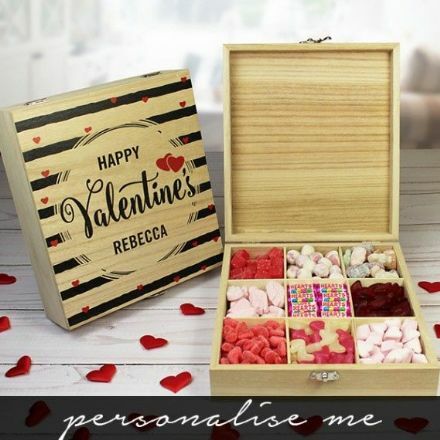 Collect your special memories inside this lovely personalised Birthday Memory Box . You can include a Name and Age. Keep it safe until the special date and reminisce those special memories from times gone by. 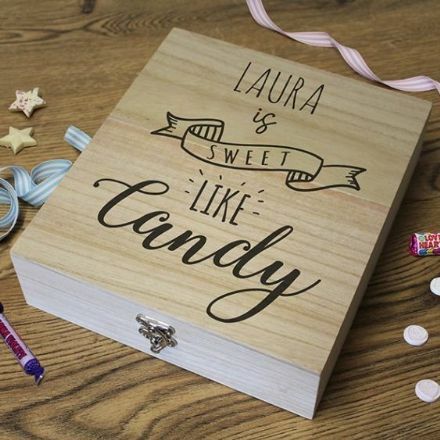 Collect your special memories inside this lovely personalised Memory Box Time Capsule. You can include a Name and date to be opened. Keep it safe until the special date and reminisce those special memories from times gone by. Lovely anniversary or special occasion gift. 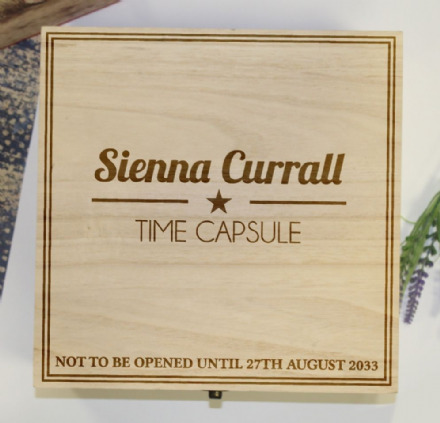 Please Note - 'Time Capsule' and 'not to be opened until' are fixed text. 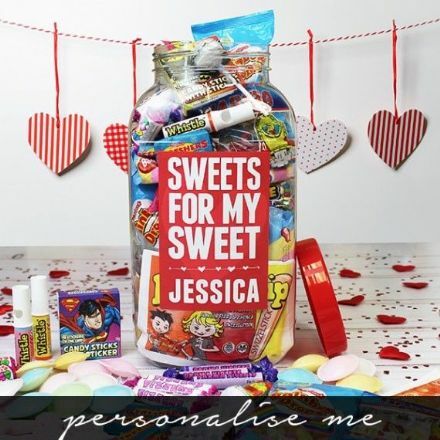 You can create you own personalised message on the 4.5 litre jar packed with your favourite retro sweets. A great Father's Day gift idea for a special birthday or special occasion. See Product information on How to Order. 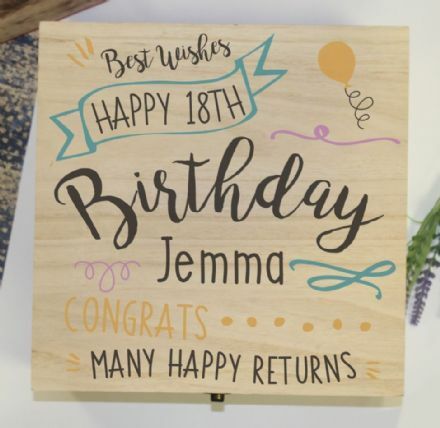 You can create you own personalised message to go with this wicker hamper.This beautiful hand made wicker hamper is packed with all of the old school classics for that nostalgic feel.. A great gift idea for a special birthday or special occasion. See Product information on How to Order. 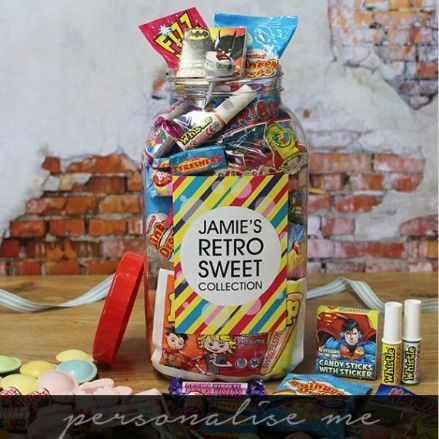 The jar is loaded with 22 varieties of your favourite classic sweets including: Parma Violets, Refresher chews, Drumstick lollies, Gob stoppers, Fried eggs, Cola bottles, Flying Saucers, Candy sticks, Love Hearts and Popping Candy to name just a few!!. See Product information on How to Order. 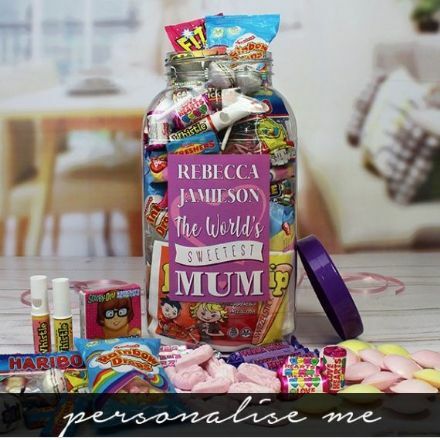 The jar is loaded with 13 varieties of your favourite classic sweets including: Parma Violets, Refresher chews, Drumstick lollies, Jelly Babies, Fried eggs, Cola bottles, Flying Saucers, Candy sticks, Love Hearts and Double Dip Sherbet to name just a few!!. See Product information on How to Order. 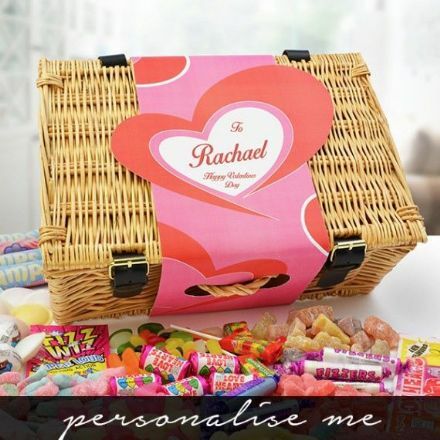 You can create you own personalised message to go with this wicker hamper packed with your favourite Jelly Retro Sweets. A great gift idea for a special birthday or special occasion. See Product information on How to Order. 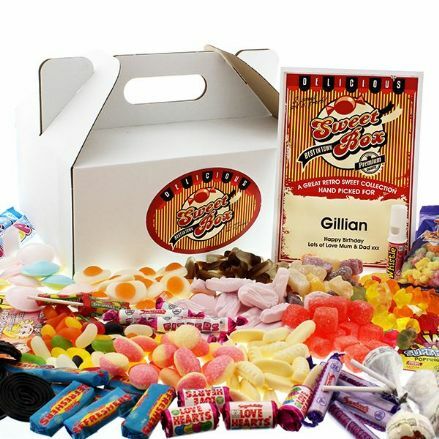 The Christmas Sweet Collection Box makes a great gift for friends and family and a great keepsake for yourself. It can be used for many years to store sweet treats for that magical Christmas time. 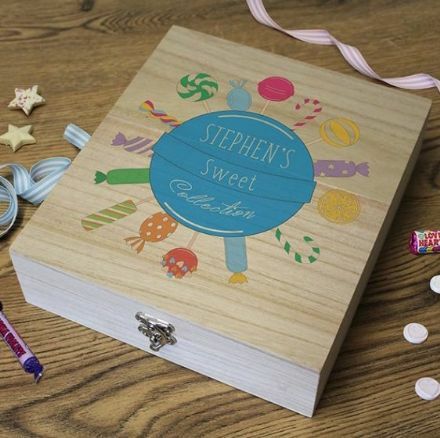 The handmade wooden box has 9 compartments, containing 9 different sweet varieties to please everyone in the family. These include Rosey Apples, Gummy Snowmen, Cola Reindeer's and White Chocolate Stars to name a few. 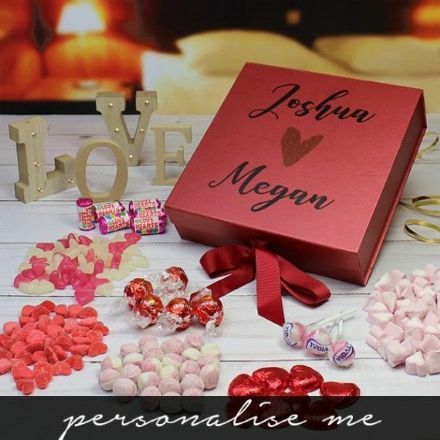 The box comes fully personalised with a family name printed on the lid. See Product information on How to Order. 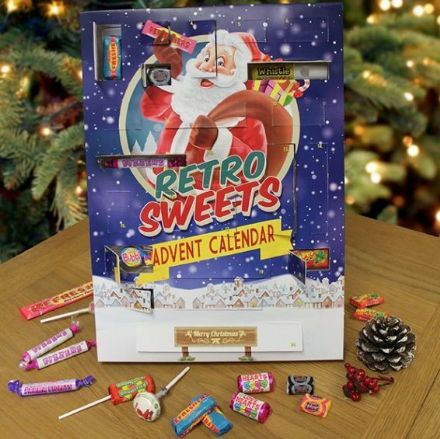 Our personalised, Retro Sweet Advent calendar is the biggest and best you can buy… Not only is it packed with 24 classic, retro sweets its personalised with your name! Perfect for kids and even better for adults who love the fun of an Advent Calendar and those nostalgic old fashioned sweets. 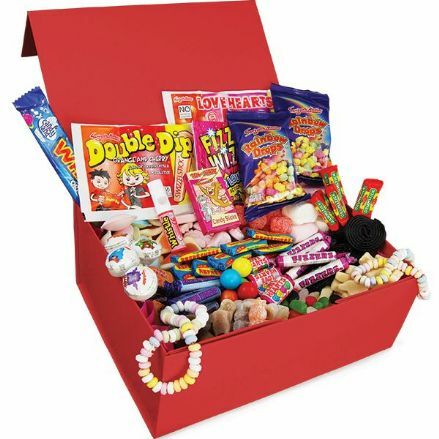 Contents include – Tattoo bubblegum, love hearts, drumstick lollies, refresher chews, fruit salads, black jacks and much more… See Product information on How to Order. If you are looking to bulk buy, please contact us directly to arrange your order. 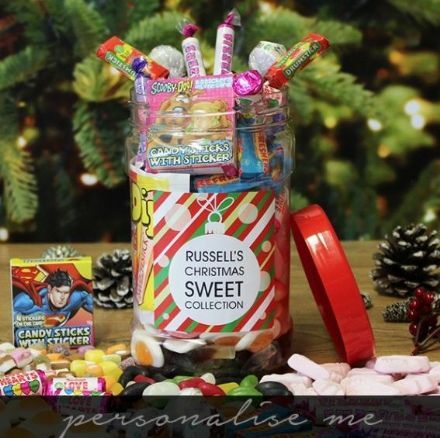 A 1.8 litre jar packed with your favourite retro sweets and a special seasonal Christmas label. 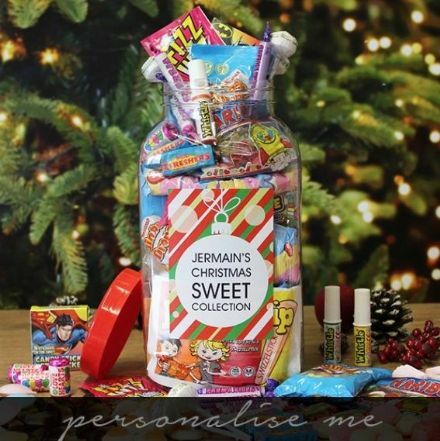 Our Christmas sweet jar is packed with 14 varieties of classic sweets including: Parma Violets, Refresher chews, Rhubarb & Custards, Jelly Beans, Cola bottles, Love Hearts and Foam Shrimps to name just a few! . See Product information on How to Order. 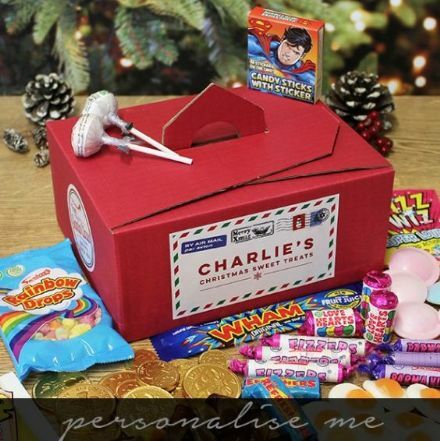 This delightful sweet box is sent directly from Santa to a very lucky recipient is packed with delicious sweets with a Christmas twist. 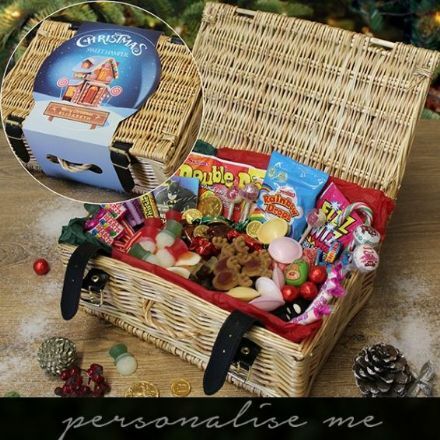 The box is personalised with a name on our novelty postage label all the way from Lapland. 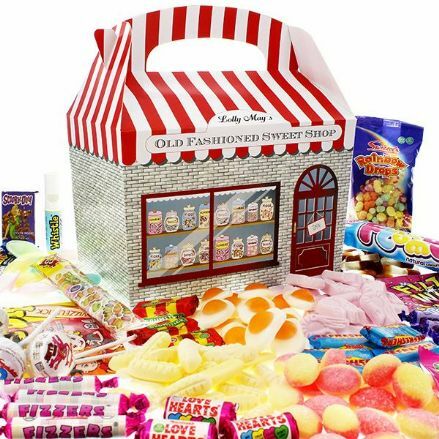 Crammed with a great collection of sweets including Cola Bottles, Candy Canes, Chocolate Coins, Flying Saucers and many many more. See Product information on How to Order. Fancy a Pint ? 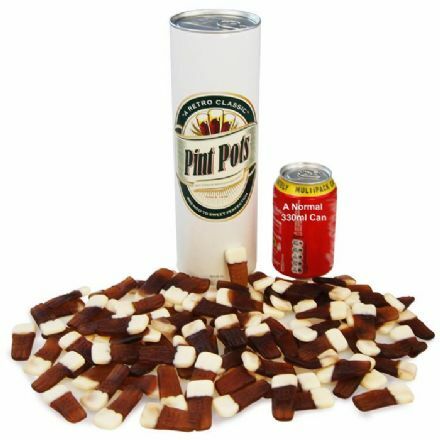 Fancy a kilo of Pint Pot beer Sweets ? 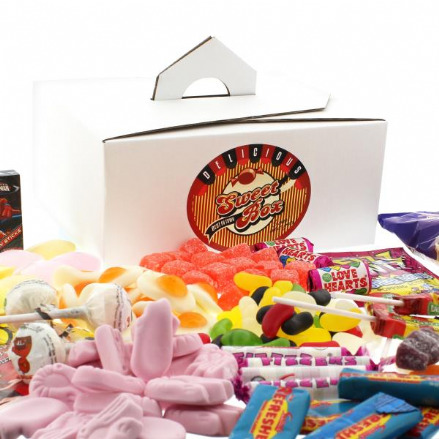 Perfect gift for the Beer Lover..
You can create you own personalised message on this Large Retro Tuck Box packed with your favourite retro sweets. A great gift idea for a special birthday or special occasion. See Edit Product information on How to Order. 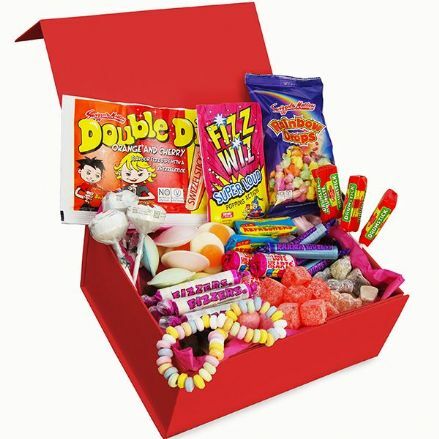 You can create you own personalised message on this medium Retro Tuck Box packed with your favourite retro sweets. A great gift idea for a special birthday or special occasion. See Product information on How to Order. 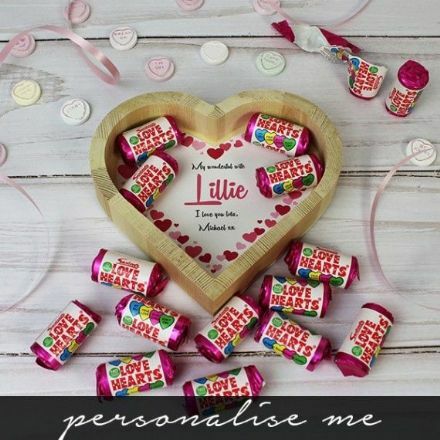 If you are looking for an affordable sweet gift that is personalised and perfect for that person who's on the go look no further than our fabulous range of Personalised sweet tubes. Each tube stands nearly 1 foot tall at 25 cm and is packed with the sweet of your choice. 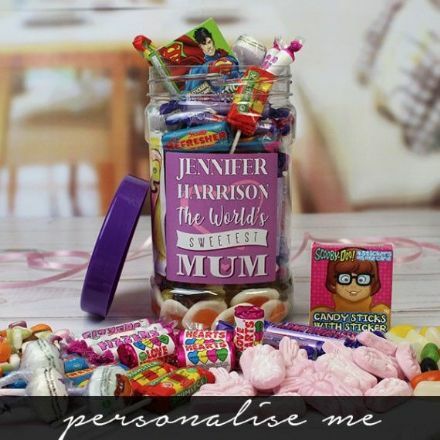 The jar is then finished with a stylish and cool personalised label. See Product Information on How to Order. Most of us have a sweet tooth (don't we ? 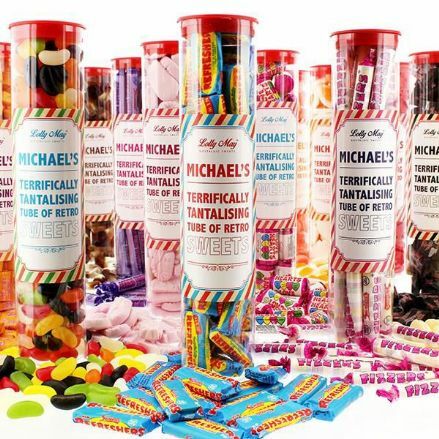 ), and ever since Mr Cadbury opened his first shop in the 1800's our appetite for all things sweet and tasty has grown ever since, Hail to the Victorians ! A gift of sweets is usually not just for the individual, but a shared experience as friends and family tuck in to the gift offering without even asking. 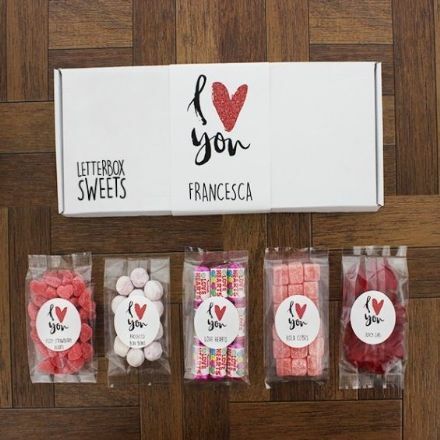 To go one step further all of our personalised retro sweet gifts come with a special message, and many with the name of the recipient. 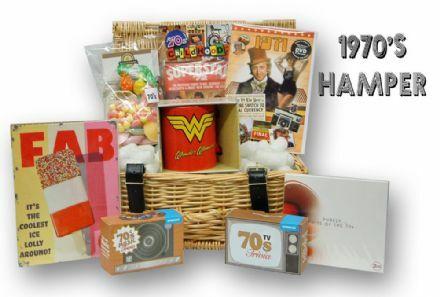 We have collated a great selection of Retro Sweet Hampers, Retro Sweet Jars, Wooden Retro Sweet Boxes and our unique range of Decade Hampers that can be designed by yourself. 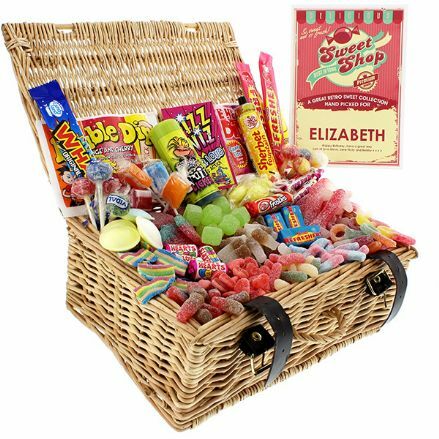 The hampers, jars and boxes will last a lot longer than the sweets inside, and can be put to use by any means, maybe for putting some more sweets inside ? 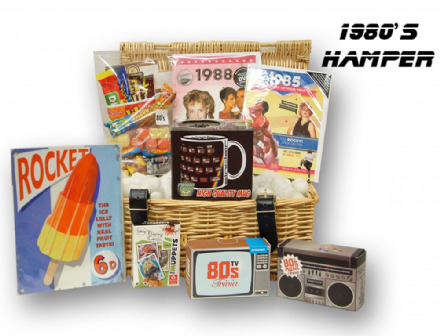 You will find a Retro Sweet Gift for all of the family in our range, and if you really love them (and want to share it with them) it's a perfect gift for a special birthday or occasion. 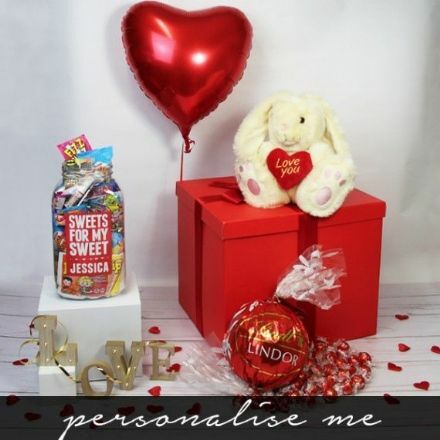 All gifts have a variety of personalised gift messaging, just pop into a product to see what's on offer. All items can be drop shipped direct to your lucky recipient if required. We carefully select products that fit with our Nostalgic range and keep searching for the next great product to add to our vaults. 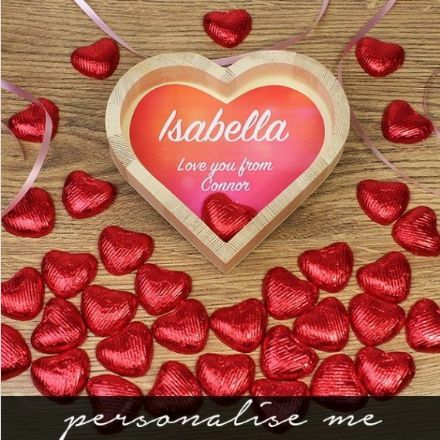 Browse through our personalised gift section to see what we've got to offer. If you cannot find the exact gift you are looking for, we have access to 1000's of gifts via our partner suppliers, and we are more than happy to find and offer you the perfect gift. 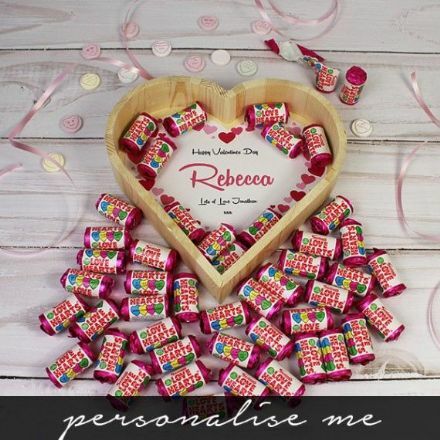 If you are looking for corporate personalised gifts then please contact us and ask us what we can do you for to find the right product for your company.